Sigma speedo meters are able to display up to 199 kms/h at a very reasonable price. Also have accumulated riding time (service intervals) and other useful information. You will need to to cut the standard wire and place a similar width one (if the wire is wider and/or different your battery would die soon). Use silicone to lock the magneto in the disc who sends the signal to the sensor. 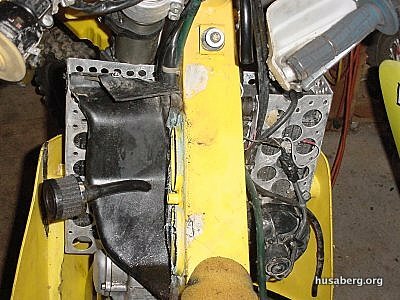 The problem with the original oil breather is that there’s always lot of oil at the air-intake side off the carb, with can cause bad starting and other carb problems. With this system, a very little bit of oil comes in the carb. Use a wide section hose since it works better. An oil breather filter used with good results. VALVES: The clearances between the valve adjustment screws and the valve stems have to be checked after 2 hours of operation when the engine is brand new or any parts of the valves, valve seats or rockerarms have been changed. The interval between the checks of the clearances is afterwards every 10 hours (Motocross and Desert models) or 20 hours (all other models). Valve adjustment: Remove the fuel tank (see “FUEL & COOLING – FUEL”). Also remove the radiator (Owner’s experience make it advisable). 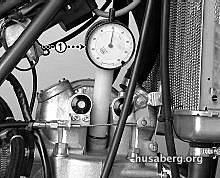 Put the engine in TDC position on compression stroke: Remove the ignition cover, install a dial indicator into the spark plug hole (Fig. 7K-1) and turn the flywheel (wrench No. 17), clockwise, in order to find the upper position of the piston. (Additional procedure place a long screwdriver inside the spark-plug hole if not dial indicator is available). 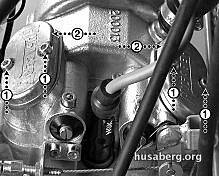 Remove the two valve inspection covers (Fig. 7L-1, 2, Allen key No. 4) including the gaskets. 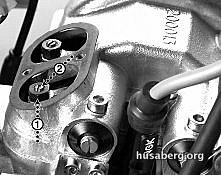 Check the clearances of the valves; 0.10 mm on both the intake valves as well as the exhaust valves. Adjust if necessary by releasing the lock nut (Fig. 7M-1, wrench No. 10) and then by adjusting the screw (Fig. 7M-2) into the adequate clearance. Refit in the reverse order of disassembly. Replace the gaskets of the inspection covers if necessary. 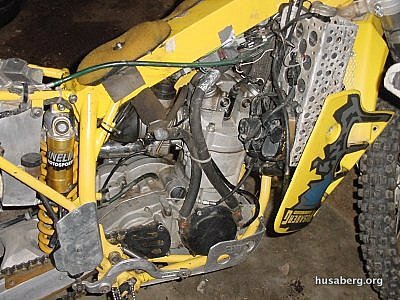 Earlier Husaberg models (1989-1996) usually suffered from excessive ignition heat. 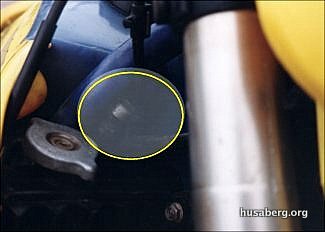 A problem that has also appeared in other 4 strokers The 1999 factory Husqvarna (Anders Eriksson) also uses this solution (factory finish of course). This ignition cover mod was used by some racers in the Spanish Enduro Championship and probably by factory in the WEC. 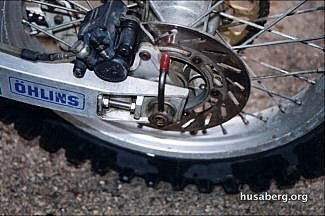 Fresh air coming from the hose (due to ignition wheel rotation) helps reducing the ignition temperature and thus ignition life and bike reliability are longer. IMPORTANT: To avoid dirt, water or anything coming into the hoses or in the ignition cover a small inox filter and a one-way valve have been installed. 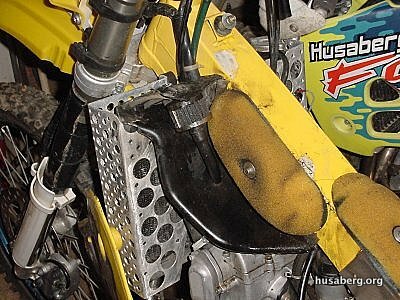 This is not really a Husaberg tech improvement. It’s just a useful trick (specially if you ride alone with a basic set of tools to survive) that helps you to remove your tyre if a flat occurs. Very easy and self explanatory, a small hole has been made though the axle and a “L-shape” inox bar is located into it. Now you only need one wrench to remove the knot. 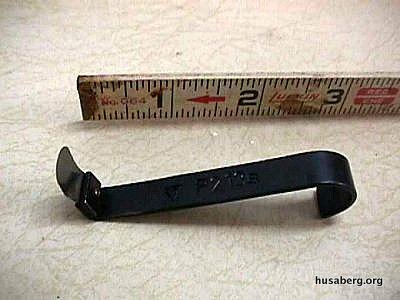 I mounted the meter on a piece of metal plumbers tape (soft iron strap, approximately ).020″ thick using Shoe Goop, (a material for repairing the soles of athletic shoes) and secured the tape under the the Scotts Damper, using the right hand side damper mounting screw. I shimmed the left side of the damper with a shim washer out of the same material. 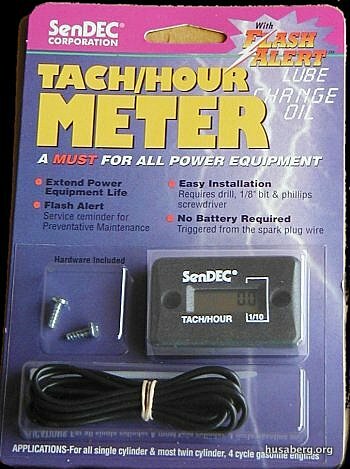 The tack uses an inductive pickup off of the spark plug lead (4 turns of wire provided with the tach). It measures up to 9000 RPM. When the engine is off, the tack displays the total numbers of operation (not reset able). It works great. Knowing how the engine sounds at various RPM’s is key to preventing over rev. 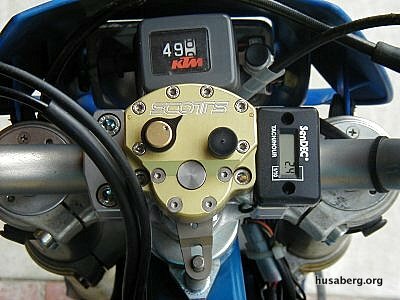 Once you become familiar with the sound of your bike at 6, 7, 8, and 9000 rpm, the meter just becomes a hours of operation meter to help you with major maintenance. SenDEC Corporations currently has this priced at $39.50 USD. 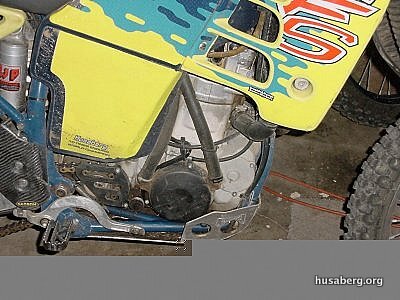 This mod was obtained from Dirt Rider Magazine and is used by Guy Cooper according to the article. I have a 94 600 FC (2 SEM ignitions previously died before this mod was implemented in the summer heat of Redding CA) ,& and a 98 FS 600, and have improved upon the technique. See the attached photos, in no certain order, as I explain how & what to do. 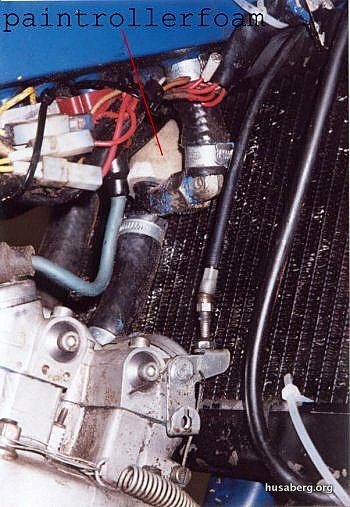 The goal is to vent the head through a mini Uni Pleated Filter situated in the left side airbox (see photo), draft the ignition as much as possible into the airbox through the fitting that used to be used for the head vent, and provide a level of confidence that water & dirt will not enter the ignition cooling system/air box. Look at the photos and you can see the basic set up. 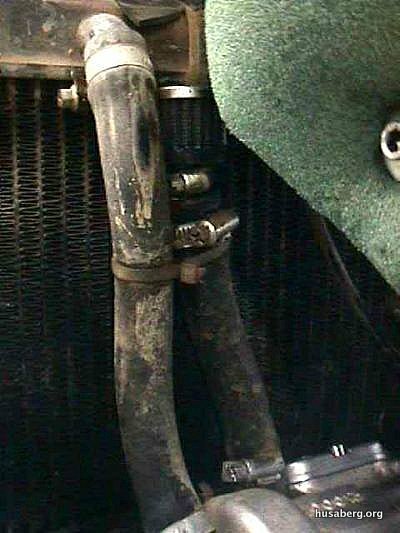 1/2 inch heater hose, with a disconnect in the middle, is used to route cooling air to/from ignition cover. 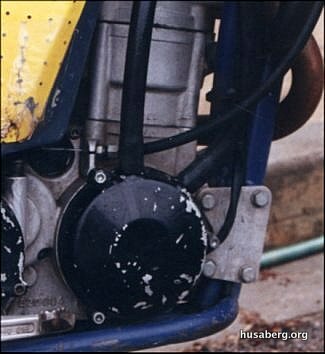 Also, although you can only see the tubing in the photo, there is an addition uni pleated filter installed inside the airbox as a last catch (in case an upstream leak past a filter or fitting develops) before the ignition cooling air gets to the carb. 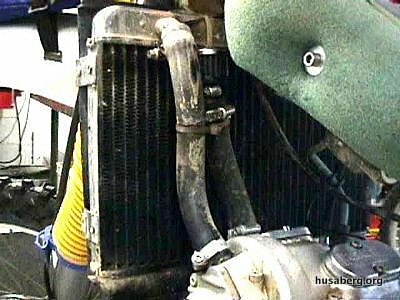 The inlet filter for the cooling system is simply a sock filter situated up in the frame as high as possible. Take great care selecting a drill bit size and 90 degree fitting for the ignition cover vent. modification. Practice on a piece of plastic before drilling your cover. You want to drill the hole, then thread in the brass fittings into the plastic. Screw in just far enough, then use silicone to seal the threads inside and out. You will have to find some adapter hoses to connect up from the brass fitting to 1/2 heater hose. 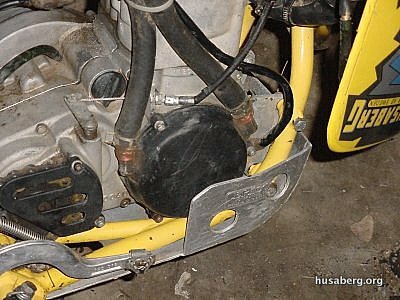 When connecting the tubing to the air box fitting, use a 1/2 ” 90 degree plastic fitting just before the connection to avoid an excessive bend on the tube & help tuck it out of the way. Drilling the plastic air box bottom and routing a tube with filter from the valve head into the left side air box is self explanatory, as is the inlet tubing with filter for the cooling system. 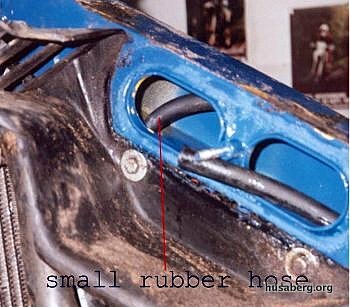 As the last bit of insurance, select the appropriate size hose with a pre-bent 90 (old emission tubing from a street bike), adapt a mini uni or sock filter on one end, and stick other end into the hole inside the airbox used for the head vent (now ignition vent). Use silicone in the hole to hold the assembly in place if it’s not as tight of fit as you’d like. This mod works, and the only reason I decided to keep the Husaberg. To accurately measure valve clearance, go to your local Porsche dealer and purchase a 911 valve adjustment gauge, and several replacement blades. 911 valves are adjusted to 0.10mm, the same as Bergs, so the blades only come in this size. This cleverly shaped tool allows you to slip it into the space and feel the clearance. Be careful not to twist the tool and tear a blade, which is why you need several replacements, for the learning curve. There are also aftermarket tools available, but the handle tends to be larger, and will not fit into the space. Get the real thing, tool number P21. (This has been discussed before, but I felt the solutions lacked polish). 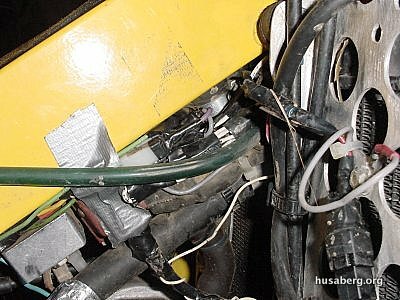 If you crash and get your bike upside down, hot oil will run through your crankcase vent hose, into the frame, and into the carb. Now, your bike will not start without cleaning everything out – not fun! Solution – remove the crankcase vent line from the underside of the frame, cut off a small section and make an appropriate plug, I used a 1/2″ copper pipe end cap. Resecure with reliable hose clamps. This seals off the frame/intake area from dirt and air leaks. 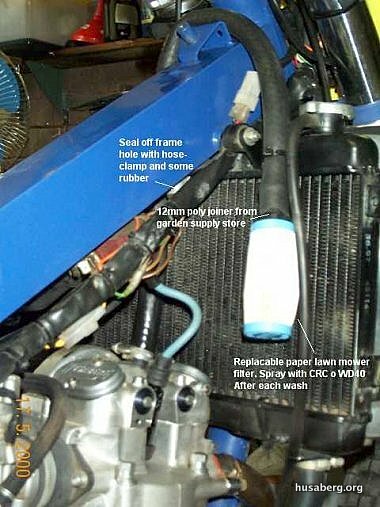 Install a small K&N air filter in the hose, secure with clamps, and tie off to the radiator hose with tie wraps. Dirt cannot get into your crankcase, which now vents through the filter to the atmosphere, although it may now drool some oil during your next big crash. BUT, you can pick up your bike and easily start it, since the carb is not filled with motor oil!. See the photos. You can source the filter through Summit Racing, part number 62-1000.